Judge David MacAdam has approved Newpage's request for creditor protection and to begin the process of selling the mill. NewPage mill will shut down its newsprint machine on Sept. 10 and the glossy paper machine on Sept. 16. ((CBC))Judge David MacAdam has approved Newpage's request for creditor protection and to begin the process of selling the mill. MacAdam said he made the decision based on the fact employees would not be paid for this week's work unless he agreed because NewPage has less than $2 million cash flow. NewPage was asking the judge to grant an order protecting it from lawsuits by its creditors and court approval to proceed with selling the plant and its assets. The company said it wanted to sell quickly so it can keep the plant in "hot idle." That means it would be ready for a new owner to step in and re-start operations immediately. NewPage would like to have a new owner by early November, according to the documents. Premier Darrell Dexter said he thinks that's the best option. "It is more valuable as an operating asset than it is being sold at distress so what we're doing is we're participating in that process to make sure that this plant remains resale ready for a new operator," he said. The NewPage pulp and paper mill has been losing $4 million a month and has not been paying its bills or contractors. It has lost more than $50 million in the last year. In the interim, NewPage has agreed to set up a reserve fund to pay woodcutters and forestry contractors owed money for deliveries made to the mill since Aug. 22. Without such a fund, the contractors who are owed nearly $3 million, planned to oppose NewPage's request to the court seeking creditor protection. That could have scuttled the company's attempt to avoid bankruptcy and try to sell the mill. The woodsman's reserve fund will contain $1.35 million, contributed by NewPage. The lawyer for the woodsmen said his clients are not excited, but instead see the fund as a "reasonable accomodation" given the present circumstances. Justice David MacAdam raised the question Friday morning of whether selling the mill is a realistic possibility. MacAdam said the proposal to trade ownership of current Port Hawkesbury assets to Ohio-based parent company NewPage Corp. for $25 million "will gut the company." The judge questioned the move, which he said is "to transfer assets at much less than their face value. Any creditors have virtually no chance of recovery." "Are we transferring assets to the parent company when in reality the [Port Hawkesbury] company is going down the tubes?" MacAdam asked. He questioned whether a sale is a "fiction,' adding he didn't believe the company had provided enough financial information for him to make a decision. "I've never seen such a dearth of financial information," MacAdam said. 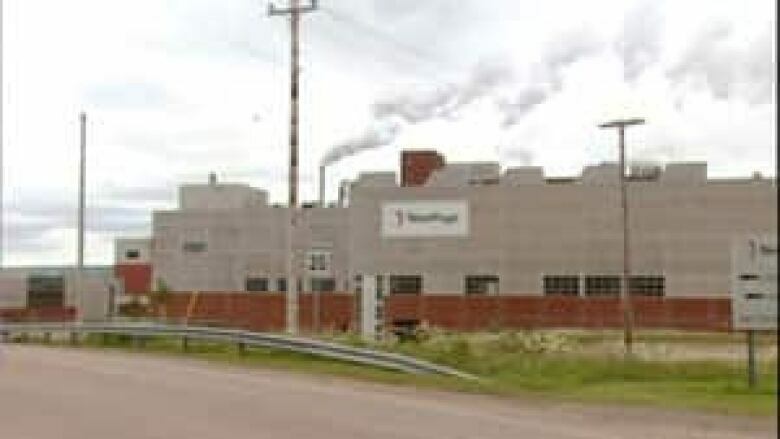 Lawyers for accounting firm Ernst & Young, which may oversee any potential sale, told the court that interested companies have been looking over the Port Hawkesbury plant in the last few days. Lawyers for NewPage Corp., said the $25 million would keep the mill open for the next 13 weeks while it tries to find a buyer. It intends to cover vacation payments for employees and make regular pension contributions. But NewPage lawyers said the company doesn't have the money to pay $20 million into its under-funded pension plan. In an 88-page affidavit filed for the hearing, mill manager Tor Suther said he believes NewPage Port Hawkesbury would "be forced to permanently shut down all operations" if the court didn't approve the mill's application. Premier Darrel Dexter was in Port Hawkesbury Friday morning to announce details of a $15 million plan he said would employ hundreds of woods workers, provide specialized training programs and keep the mill ready for a quick re-sale. "As premier, the best thing I can do to support workers, families and contractors — now and in the future — is to ensure this mill finds a good new owner," Dexter said. "The province's action plan will help ensure a more secure future for the people of the Strait area." The seven-point plan will expand the province's silviculture program, stockpile wood for future use in the Strait to keep harvesters and truckers working, and ensure Crown forest roads are maintained in the NewPage Port Hawkesbury harvest area. It will also ensure the mill is able to retain a core team of about 20 woodlands to oversee the appropriate use of Crown land, amend the Credit Union. There will be a small business loan program to better address financing concerns for contractors and other small businesses, invest up to $3.5 million to develop specialized training programs and engage a world-market specialist to complete a market study to understand the global markets and identify opportunities. This plan will also have to be approved by the court. NewPage announced on Aug. 22 that the newsprint machine will shut down on Sept. 10, while the machine that produces glossy paper for magazines will be turned off Sept. 16. The closure will affect 600 people who work in the mill and 400 people who work in the woods. Hundreds of others depend on the plant for indirect jobs.